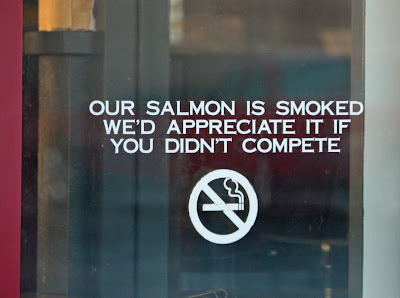 Smoking is illegal in restaurants these days, but this sign on a cafe gets kudos for creativity. I always appreciate these clever signs. This is one of the better ones. Well spotted! I laughed when I saw this sign! Very good!! And humor! I love it! That's a rather clever sign! Ohhh I LOVE their bagels!